AVL enables dispatchers to see where every fire vehicle is located and send the closest unit to an emergency, no matter which fire department it belongs to. This can significantly reduce response times potentially saving lives in a medical emergency or keeping a small fire from becoming a major fire. AVL also enables fire commanders to better manage a fire by seeing where all units are located and move them to help save homes as the fire moves and to protect firefighters as winds shift a fire’s path. AVL equipment already exists in city fire department apparatus, but most rural areas of the county lack this equipment due to having lower tax revenues caused by relatively low population in the area. “The addition of AVL to our rural fire department vehicles will allow us to track our vehicles in real time, dispatch them to emergencies more effectively, and get help to people who need help much faster,” said Tony Mecham Cal Fire Unit & San Diego County Fire Chief. AVL equipment will be provided to 23 fire stations serving the communities of De Luz, Harbison Canyon, Potrero, Descanso, Jamul, Lake Morena, Jacumba, Pine Valley, Campo, Boulevard, Mount Laguna, Warner Springs, Julian, Cuyamaca, Ranchita, Sunshine Summit, Rincon, Palomar Mountain, Ramona, Intermountain, Ocotillo Wells, Shelter Valley, and Lakeside. 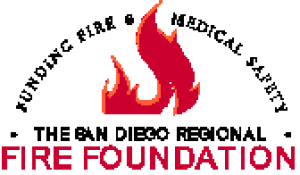 The San Diego Regional Fire Foundation was formed in 1989 to improve the system of fire and emergency services in San Diego County. It has provided $5 million for first responder equipment and training; works to increase public awareness; and facilitates cooperation between cities, fire departments, county agencies, corporations, and other foundations on public safety issues.